I tend to stick closer to home as the weather gets cooler. I have lots of pictures of fall leaves, but they are just about all from Confederation Park! One of my favorite things to do in the fall is to take my son out to play in the leaves. 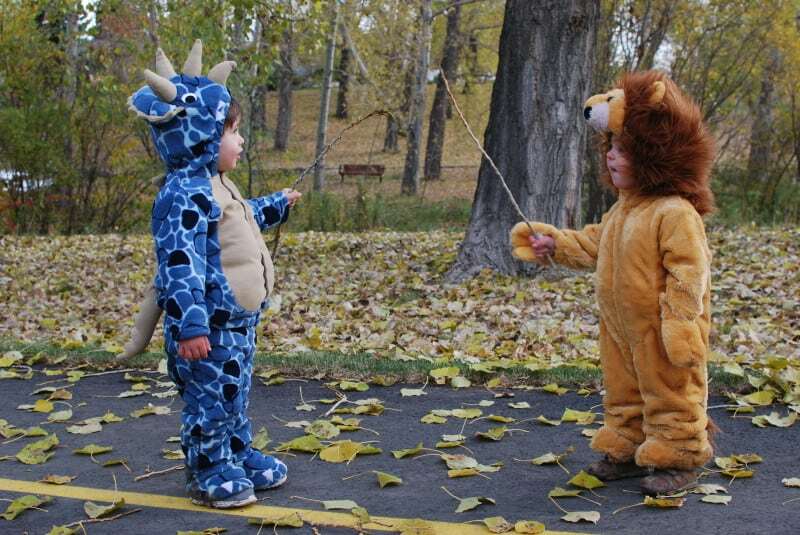 If you want to take playing in the leaves to the next level, dress the kids up in Halloween costumes and go for a walk in the park. Below are some suggestions for where you could go to make your own Fall memories. 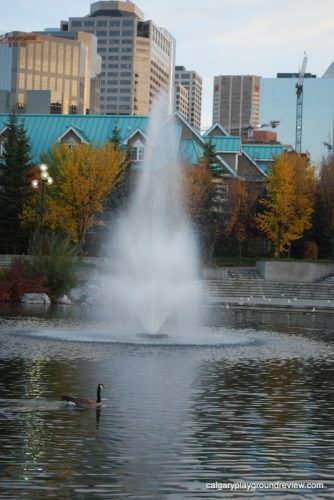 Confederation Park – 24 Avenue & 14 Street NW to 30 Avenue & 10 Street NW: This is my favorite park in the fall, it’s a gentle walk with lots of great photo opportunities including a wetland pond with ducks, bridges, great climbing trees, a small playground and lots of yellow Poplar leaves. Edworthy Park – South Access – Bow Trail & Spruce Drive SW. North Access – Shaganappi Trail and 16 Avenue: Edworthy Park is densely forested with tree s including aspen, willow and balsam poplar. Although the numerous picnic areas are close together, the trees provide nice seperation between them. The park also features pathways, flat grassy areas and four small playgrounds. Gordie’s favorite feature is the CP Rail line which runs right through the centre of the park, – you can often see a train right up close while you’re there and even get a great shot with the train as a backdrop. A trip to Prince’s Island necessitates a bit of a walk as there is no traffic on the island; however, it is well worth the trip. The park has water all around with a wetlands area to the east and a lagoon area with ducks to the south. There are also plenty of pathways, small rolling hills and a fantastic playground. The trees in Prince’s Island Park are varied and feature red and purple leaves in addition to the yellow leaves more typically found in Calgary. North Glenmore Park – 7305 Crowchild Trail SW: Located on the North side of the Glenmore Reservoir, North Glenmore Park is a fun spot for fall photos. The park features an extensive pathway system, picnic areas, two playgrounds, great views of the reservoir and large mature trees. Located just across the reservoir is South Glenmore Park. This park has a lovely pathway system with plenty of large mature trees, two playgrounds, picnic spots and some lovely views of the water. Carburn Park – 67 Riverview Drive SE: Taking a walk along the pathways in Carburn Park, it’s hard to imagine you’re in the middle of the city. In addition to the Balsam Popular trees and colorful shrubbery, Carburn Park features man-made ponds, river access, picnic areas and a playground. Bowness Park is another great option. Although currently undergoing some construction, there should still be plenty of opporutnities to take advantage of the beautiful fall leaves in the park. 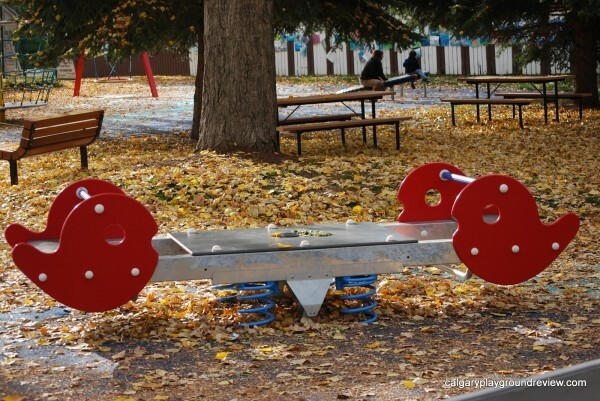 Bowness park features a few playgrounds, a lagoon, picnic areas and pathways. If you are looking for less of a walk and more of a play at the park, Nellie Breen Park would be an excellent choice. It’s a small park that is almost entirely taken up by a sprawling playground. The park is beautiful with large mature trees and a gazebo. I think this park is used more often as a photo backdrop than anything else. The ruins will give a really unique setting and would suit scary costumes extremely well. The leaves from the mature trees will enhance the effect. Where is your favorite place to take pictures of fall leaves? Great suggestions! We also love North Glenmore park as well as Griffith Woods and the Inglewood Bird Sanctuary for fall walks.